NETWORK FINALS: The 7PM rerun of THE SIMPSONS gained 0.1 in final numbers, while the rerun ELLEN’S GAME OF GAMES lost the same. CABLE HIGHLIGHTS: There’s been a lot of spin around, but it stood to reason that the Season 2 premiere of KILLING EVE was going to get the show’s highest ratings to date, now that it’s being simulcast on AMC, a network with a much larger daily audience than original platform BBCAmerica. In fact, it seems fair to call the result distinctly disappointing with that in mind, considering that the BBCAmerica Season 1 finale was at 0.13, and AMC only managed 0.15 despite enormous marketing, with the BBCAmerica telecast adding 0.10. Adding insult to injury, the far less heralded linear premiere of A DISCOVERY OF WITCHES (available for months via streaming) was at 0.17 on AMC, although that was much lower on BBCAmerica, off the chart at 0.03/225K. The rest of scripted was subdued, as all of pop culture awaits next week’s return of GAME OF THRONES. On HBO, LAST WEEK TONIGHT edged up 0.02 to 0.28, BARRY ticked down to 0.15, and VEEP was down 0.03 to 0.15. Adult Swim’s LAZOR WULF was at 0.25/0.20. On Showtime, BILLIONS rose 0.03 to 0.19, the season premiere of THE CHI was at 0.13, down 0.06 from last year’s season premiere, and down a disheartening 0.19 from the Season 1 finale, and ACTION gained 0.02 to 0.03/133K. 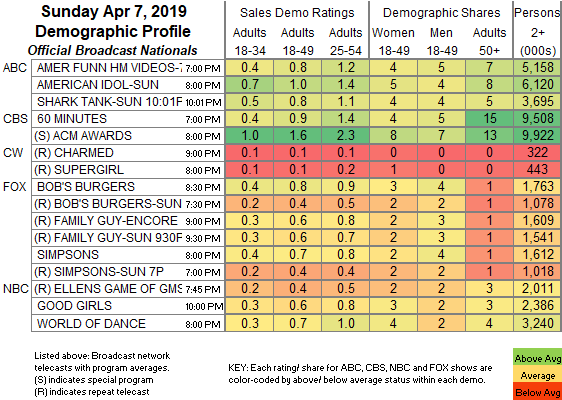 On Starz, AMERICAN GODS nudged down 0.02 to 0.08, and NOW APOCALYPSE was steady off the chart at 0.02/85K. Unscripted was led by Bravo’s REAL HOUSEWIVES OF ATLANTA, up 0.06 to 0.87, with MARRIED TO MEDICINE down 0.02 to 0.35. ESPN’s coverage of the NCAA WOMEN’S CHAMPIONSHIP game was at 0.75, and its MLB SUNDAY NIGHT game was at 0.48. On E!, KEEPING UP WITH THE KARDASHIANS dropped 0.09 to 0.53, and VERY CAVALLARI ticked down to 0.26. Food Network’s BUDDY VS DUFF rose 0.05 to 0.44. FOx Sports 1’s NASCAR race was at 0.42. 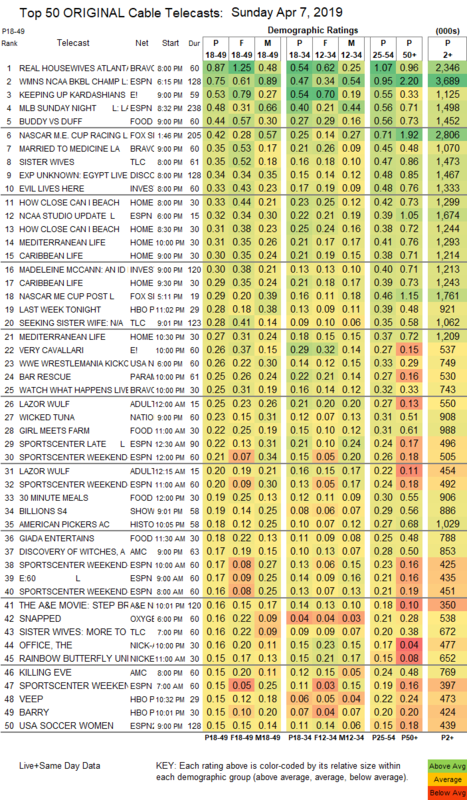 On TLC, SISTER WIVES edged up 0.02 to 0.35, and SEEKING SISTER WIFE was steady at 0.25. Discovery’s EXPEDITION UNKNOWN was at 0.34. On ID, EVIL LIVES HERE climbed 0.06 to 0.33, and MADELINE MCCANN: AN ID MYSTERY was at 0.30. HGTV’s line-up was led by HOW CLOSE CAN I BEACH at 0.33/0.31, compared to last week’s 0.30/0.27. USA’s WWE WRESTLEMANIA KICKOFF special was at 0.26. Paramount’s BAR RESCUE fell 0.07 to 0.25. Do you have Go Away, Unicorn at 6:30 AM on Disney Channel, please? Do you know what the 3X3U National Championship at 3pm on ESPN2 drew? Sorry, we don’t provide ratings here for sports telecasts that are too low for either the weekly Skedball post or the daily Top 150. There are just too many of them. Did Discovery of Witches simulcast on BBC America not make the chart? No, it’s now in the text. Very strange how it did better than Killing Eve on AMC, but that potential BBCA audience just disappeared. Woah. DC Super Hero Girls got quite a big bump compared to the previous three weeks. MAYBE it has some hope of surviving after all…. too bad that now the show is going on hiatus…. Was the Indycar race on NBCSN too low to make the list? It was reported elsewhere as having 296000 viewers. Mitch, Thanks for those words re: Killing Eve. I was thinking the same, but was reading the hype on other sites so figured I was off or misunderstanding something. It isn’t only the simulcast, but also the awards and hype the show got that it didn’t get a bump off of. I realized I was correct in my assumptions. Patrick: IndyCar on NBCSN did get 296,000 viewers with a .20 rating.